The National Children's Museum celebrated its new and improved space, located along Pennsylvania Avenue at Woodrow Wilson Plaza. 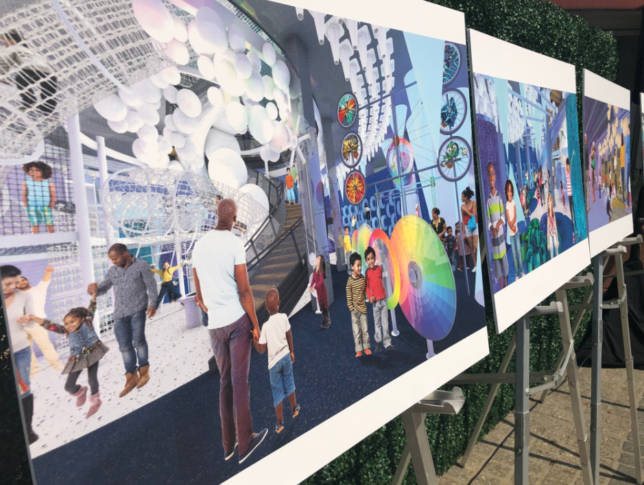 WASHINGTON — The National Children’s Museum celebrated its new and improved space, located along Pennsylvania Avenue at Woodrow Wilson Plaza. The event featured performances by local youth dance groups, including Kids Konnection DC and Capitol Movement Institute Kids. The new architectural plans for the building were also revealed. Crystal Bowyer, president and CEO of the museum, shared plans to approach learning with a focus on teaching science, technology, arts and math through interdisciplinary experiences. “You don’t just teach environmental science, but you teach environmental science while kids are painting and creating,” said Bowyer. Some of the features include a new mezzanine area, a Nickelodeon tech experience and additional spaces for kids to imagine, learn and play. Congresswoman Eleanor Holmes Norton was among those to welcome the new staff to the area and congratulate them on creating an innovative learning environment at Monday’s event. The museum has been without a home for several years. It was briefly relocated from near Union Station to a small area at National Harbor before closing in 2014. It will reopen its doors in March 2019.